CheapScholar’s FREE Scholarship Database serves as a wonderful resource that helps to connect students with scholarship opportunities. You have the ability to filter your search results by gender, state, career goals, interests, religious affiliation and much more. No login is required. College Board’s Scholarship Search is an online tool to help you locate scholarships, internships, grants, and loans that match your education level, talents, and background. Complete the brief questionnaire and Scholarship Search will find potential opportunities from their database of more than 2,300 sources of college funding, totaling nearly $3 Billion in available aid! MeritAid.com has taken the time to put together a scholarship database representing over 1,800 colleges nationwide. This database houses nearly 23,000 merit based scholarship programs and claims the combined value to be about $11 Billion dollars. Sallie Mae Scholarship Database boasts having over 3 million different scholarships with an estimated value of nearly 16 billion dollars. You have to set up an account but Sallie Mae guarantees that its superior search technology will be sure to generate a number of scholarship leads matching your qualifications. Scholarships360.org is a great resource for students and families that are looking for outside scholarships to help defray college costs. The best part about Scholarships360 is that you don’t have to work hard to find scholarships – they deliver them directly to you, via your email, every day of the year. Searching for scholarships has never been easier! Zinch.com has served as a reliable resource for helping to match high school students to the dream college of their choosing. Now they are helping those same students by providing a comprehensive (and interactive) scholarship database that connects students with dollars that they can use to pay for college. Fastweb.com is the nation’s leading scholarship search database. The best part about using their web-based scholarship service is that it is FREE! Sign-up is easy and searching their scholarship database is even simpler. The only downside is that a good number of people are looking for the same scholarship dollars that you are seeking. So, you will want to sign up sooner than later for Fastweb and apply for all of the scholarship programs that you qualify for because the early bird truly does get the worm when it comes to most of these scholarship programs. As I find other reputable scholarship search databases, I will be sure to add them here — so bookmark this page! In an effort to help make college more affordable, CheapScholar.org will be giving away $500 this year to one deserving student. 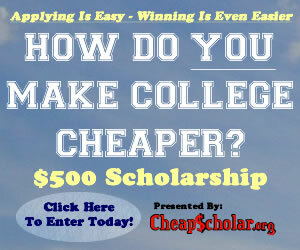 Entering the scholarship giveaway is easy and winning is even easier. All you have to do is answer one question: HOW DO YOU MAKE COLLEGE CHEAPER? Click Here To Enter! Another great resource for additional scholarship dollars lies within your community. You just have to go out and find it. Easier said than done though… You will want to check with local not-for-profit groups and clubs to see if they have any scholarship monies available. Most of the students/families I have talked with have had great success with Kiwanis, Lion’s Club, Rotary Club, Private Foundation’s, etc… Chances are that most of these scholarship opportunities will be one shot deals (meaning that you receive the scholarship for your first semester or first year of college), however, some of these scholarship programs may be renewable and you need to inquire about the requirements for getting the funds for subsequent years/semesters. The competition for these local dollars are usually not as overwhelming as you will find on the national scholarship programs, so any effort you put in locating these scholarship programs are sure to provide benefit to you in paying for college. If you already know which College or University you will be attending, you will want to make friends with the Financial Aid Office before you even hit campus. Universities and Colleges receive money from donors for the purpose of awarding scholarships to attending students. However, sometimes these donors put restrictions on who can receive the funds. Usually the restrictions are limited to a certain area of study, someone graduating from a particular high school, or someone that has a specific extra-curricular interest. It may take a little research but if you find that you match one of these donor’s requirements, you may be able to score extra scholarship dollars. I receive notification on a regular basis from different organizations providing scholarship opportunities for students. I instantly weed through the gimmicky ones and try to locate the scholarship programs that come from reliable sources and have a track record of providing consistent funding for students. If they meet this criteria, I will post information about them on CheapScholar.org. If you would like to hear about scholarship opportunities (along with other helpful information), you should subscribe to receive our updates via email , follow us on Twitter, or like us on Facebook. Can Outside Scholarships Impact My Financial Aid? Want To Study Abroad? Here Is A Million Dollars To Help!